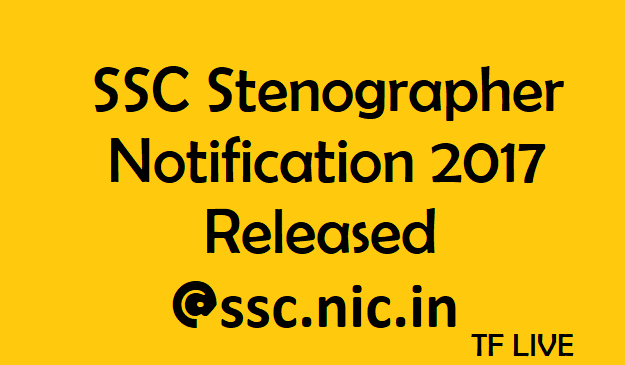 The SSC Stenographer Notification 2017 has been released for Stenographer Grade C (Group B Non-Gazetted) & D (Group C Non-Gazetted) Examination 2017. Candidates seeking for Latest Central Govt Jobs can register through online mode from 17th June 2017. Aspirants have to refer official portal for complete details and then start enrolling for SSC Steno Grade C & D Vacancies at ssc.nic.in or ssconline.nic.in. Open Competitive Computer Based Examination for SSC Stenographer Recruitment 2017 may conduct in the month of September 2017. Candidates from various regions like Western Region, Southern Region, Kerala Karnataka, North-East Region, North-Western Region, Madhya Pradesh Region and Northern Region can register for SSC Steno Online Application 2017. Candidates have to check eligibility criteria details while applying for SSC Steno Grade C & D Vacancies. Applicants should have passed 12th Standard or its equivalent qualification from any recognized Board or University. The age limit should be between 18 to 27 years as on 1st August 2017. The selection process is Computer Based Test (CBT) and Skill Test. Aspirants soon download the SSC Steno Online Application 2017 from ssconline.nic.in and complete the process on or before July 15. Candidates need to pay Rs.100 through online mode for SC/ST Category there is no fee. The active link of SSC Stenographer Notification 2017 is available at end of this article. Therefore, more details regarding SSC Steno may furnish soon.